As a part of our holistic community development effort, we understand that creating economic opportunities for community residents is essential.We have accomplished this goal in past years by funding a minority contractor training academy, operating a neighborhood farmer’s market and partnering with our local food bank to build a production kitchen for job training. Currently, we are focused on building two youth businesses, sponsoring a thriving community garden, and sparking the revitalization of the Reynolds Avenue corridor through the finished construction of the Youth Entrepreneurship & Volunteer center. The ultimate goal of our economic development projects is to create opportunities for local residents to build and sustain their income. We recognize a healthy community is one where individuals have genuine opportunities for earned income. That income must also remain in our community through additional opportunities for local spending that create economic opportunities for others. The Chicora Place Community Garden is located in the heart of our community on North Carolina & Spruill Aves. 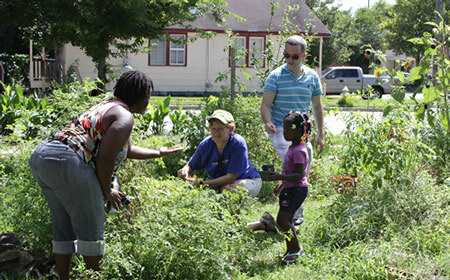 In 2011, under the leadership of Metanoia homeowner and Clemson Master Gardener Germaine Jenkins, neighborhood residents and volunteers began the transformation of a ½ acre vacant lot used for illegal activities into a thriving, sustainable community garden. We recognize neighborhood youth are key stakeholders in the economic revitalization of our community. Early on in our work, we discovered our neighborhoods are full of driven and talented youth, tired of seeing their friends tempted by the allure of a quick buck in the local illegal drug economy. We cut the ribbon on the new Youth Entrepreneurship & Volunteer Center in May 2014. 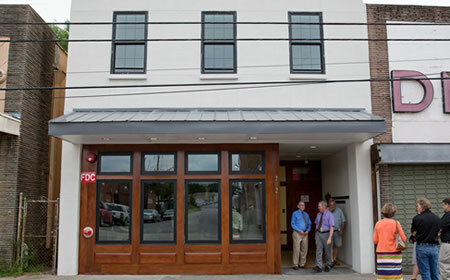 We believe this building will be a ‘spark’ in the commercial revitalization of the Reynolds Avenue business corridor. Our youth entrepreneurs are busy at work, developing job skills and making shirts and jewelry for local organizations. Several volunteer groups have already stayed there.